While in Nepal recently I was keen to find some Nepali literature. 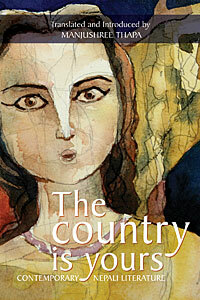 The Country is Yours is a collection translated into English by Manjushree Thapa and featuring stories and poems written in the period leading up to and after the re-establishment of democracy in 1990. The feeling is of renewed self-expression and the works cover not only the sense of emerging political freedom but also “more personal visions of transcendence”. The book is divided into sections to cover the four themes: ‘The Perplexity of Living’; ‘The Right to Desire’; ‘The Imminent Liberation’ and ‘Visions’.